Giardia is a genus of anaerobic flagellated protozoan parasites of the phylum Metamonada in the supergroup "Excavata" (named for the excavated groove on one side of the cell body) that colonise and reproduce in the small intestines of severalvertebrates, causing giardiasis, commonly known as Beaver fever. Their life cycle alternates between an actively swimming trophozoite and an infective, resistant cyst. The genus was named after French zoologist Alfred Mathieu Giard. Like other diplomonads, Giardia have two nuclei, each with four associated flagella, and lack both mitochondria and a Golgi apparatus. However they are now known to possess mitochondrial relics, called mitosomes. These are not used in ATP synthesis the way mitochondria are, but are involved in the maturation of iron-sulfur proteins. The synapomorphies of genus Giardia include cells with duplicate organelles, absence of cytostomes, and ventral adhesive disc. 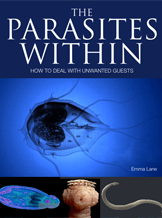 Giardia lives inside the intestines of infected humans or other animals. Individuals becomeinfected through ingesting or coming into contact with contaminated food, soil, or water. TheGiardia parasite originates from contaminated items and surfaces that have been tainted by the feces of an infected animal. The symptoms of Giardia, which may begin to appear 1½ - 2 weeks after infection, include diarrhea, excess gas, stomach or abdominal cramps, upset stomach, and nausea. Resulting dehydration and nutritional loss may need immediate treatment. The typical infection within an individual can be slight, resolves without treatment, and lasts between 2½ - 6 weeks. Medication containing tinidazole or metronidazole decreases symptoms and time to resolution.